We always choose a family costume theme. This year was Alice in Wonderland. 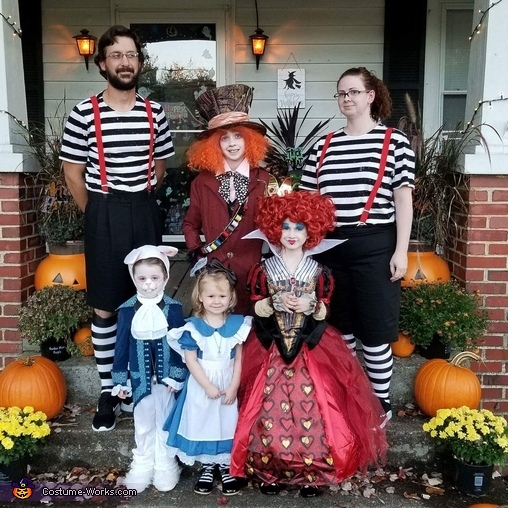 Ruby,9, is the Mad Hatter, Scarlett,6, is the Red Queen, Rose,3, is the White Rabbit, Violet,2, is Alice and my husband Ben and I are Tweedle Dee and Tweedle Dum. All the costumes are store bought with added extra touches and accessories. The girls had so much fun with the costumes this year! I think they look great!